Through her popular Etsy shop, Paper & Peony, Chantal Larocque creates custom paper flower arrangements forevents, weddings and everyday, all infused with her signature bold style and fun colours. Now, with this book readers can learn how to make her flowers and favourite arrangements step by step using easy-to-find supplies and common cardstock. Chantal's use of cardstock instead of the more common tissue or crepe paper gives the flowers a unique bold and full appearance that stands out. With this simple trick, no fancy tools or difficult-to-work-with papers are required, as in other paper flower books on the market. Readers will be amazed at how quick and easy it is to craft these stunning flowers and arrangements. Not only do readers learn how to make each bloom step by step, they also learn to use a variety of those blooms for stunning statement arrangements. The photos showing each step reveal Chantal's secret techniques that give a life-like look to the flowers. Templates are provided at the back of the book for readers to trace onto their cardstock and cut out the petals and leaves. With this helpful and inspiring guide, readers will love creating bold and colourful flower arrangements that last forever. 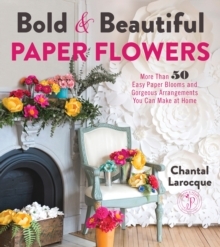 This book has 65 paper flower projects, including arrangements and bouquets, and it has more than 100 photos.